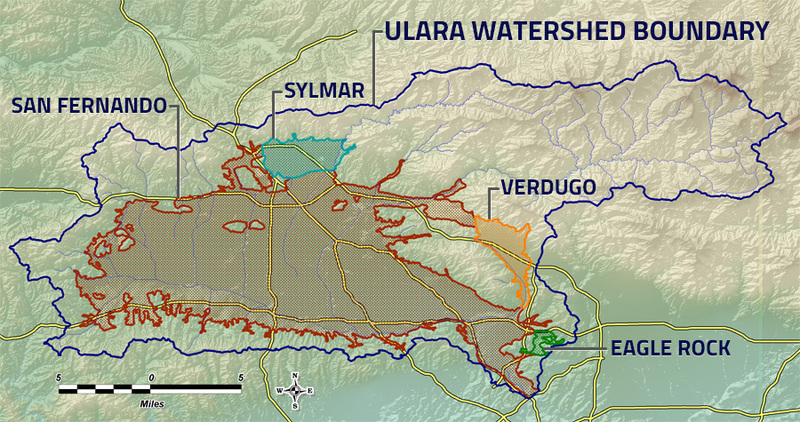 The Sylmar Basin, in the northerly part of ULARA, is the second largest basin, and it consists of 5,600 acres and comprises 4.6 percent of the total valley fill. It is bounded on the north and east by the San Gabriel Mountains; on the west by a topographic divide in the valley fill between the Mission Hills and the San Gabriel Mountains; on the southwest by the Mission Hills; on the east by sedimentary rocks along the east bank of the Pacoima Wash; and on the south by the eroded south limb of the Little Tujunga Syncline. According to the Sylmar Basin Stipulation of March 22, 1984, as of October 1, 1984, the cities of Los Angeles and San Fernando were assigned equal rights to the safe yield of this basin, exclusive of the rights of overlying private parties. The Stipulation also eliminated the right of Los Angeles and San Fernando to capture "return water". The safe yield value in the Judgment was 6210 AF/Y (3255 AF/Y for each of the 2 ciities). The only potentially active private party with overlying rights within the Sylmar Basin is Santiago Estates. As a successor to Meurer Engineering, M.H.C. Inc. owned Santiago Estates as of June 1998. Pumping by Santiago Estates is deducted from the safe yield and the two cities divide the remainder. Santiago Estates has not pumped any groundwater from this basin since the 1994-95 Water Year. On July 16, 1996 the original Watermaster (Mr. Blevins) increased the safe yield of Sylmar Basin from its value in the Judgment (6,210 AF/Y) to 6,510 AF/Y, an increase of 300 AF/Y. On March 29, 2006 the second Watermaster (Mr. Mackowski) conditionally increased the safe yield to a total of 6,810 AF/Y, which represented 3,405 AF/Y for each of the 2 municipal-supply purveyors (Los Angeles and San Fernando). In a report dated July 31, 2012 the current Watermaster (Mr. Slade) provided his analysis of newly-available data and conditionally increased the safe yield of this basin to 7,140 AF/Y; this amounts to 3,570 AF/Y for each of the 2 main parties. In his report, the Watermaster identified a provision in the Judgment that precludes accrual of groundwater credits in this basin for more than 5 years, and also developed a practical solution to preserve most of the accrued credits without risking the long-term health of the basin. Los Angeles and San Fernando each has a right to store in-lieu groundwater and the right to extract equivalent amounts.